During the fall of 2018, I did a quick tour of cities on the East Coast, and the Midwest As of early 2019, the only photography I've done in Missouri is of Kansas City, but I'm sure there's more to see. I'll get back for more photography one day. During the fall of 2018, I did a quick tour of cities on the East Coast, and the Midwest. 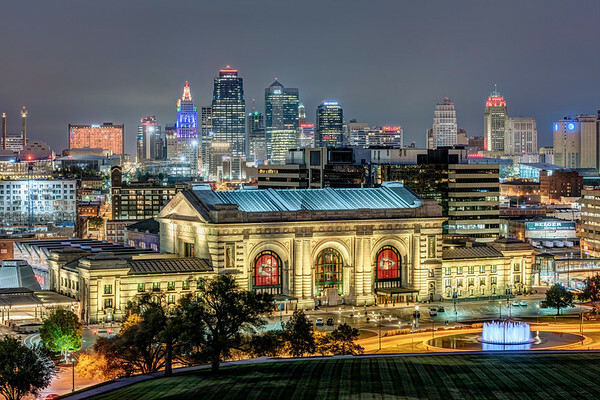 One of the cities I was fortunate enough to photograph was Kansas City, Missouri. I did a quick Google search for the best places to photograph the Kansas City skyline, and near the top of the list was Kaw Point, which is the location from which I took this photo. I like that I was able to get the entire city skyline reflected in the Missouri River. Available in the following sizes (Panorama B): 30x12, 40x16, 50x20, 50x20 Triptych (3 x 17x20), 60x24, 60x24 Triptych (3 x 20x24), 75x30, 75x30 Triptych (3 x 25x30), 90x36, 90x36 Triptych (3 x 30x36), 105x42 Triptych (3 x 35x42), 120x48 Triptych (3 x 40x48).